HANGZHOU -- Powerful Typhoon Krosa made landfall in east China on Sunday afternoon, forcing the evacuation of more than one million people in provinces Zhejiang and Fujian. Premier Wen Jiabao has ordered relevant government departments to strengthen safety inspections and put public safety "first and foremost" when facing Typhoon Krosa. Vice Premier Hui Liangyu asked locals to "stand to their posts" and enhance coordination to "closely monitor the development of the typhoon and rainstorms". "Local departments should continue to evacuate people in danger and order organized boats back to the harbor to shelter from the wind," Hui told an emergency meeting on Sunday morning. Hui also said the safety of reservoirs and flood control projects should be ensured to prevent landslides. Krosa, the 16th typhoon this year, packing winds of up to 126 km per hour, had forced the evacuation of more than 1.41 million people and 75,000 fishing vessels in the two coastal provinces by midday on Sunday. It left four dead, two missing and 52 injured in Taiwan, in addition to cutting off power supplies and halting highway and air traffic, local media reported. Krosa, the 16th typhoon this year, landed at 3:30 p.m. on Sunday near the borders of Zhejiang's Cangnan County and Fujian's Fuding City, packing winds of up to 126 km per hour, the Zhejiang Provincial Flood Prevention and Drought Relief Headquarters said. 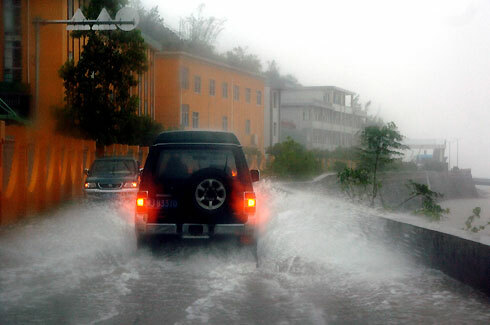 It continued to move northward at a speed of 20 km per hour after making landfall, but its force gradually weakened, the Fujian Provincial Meteorological Observatory said. Krosa is expected to trigger gale force winds, torrential rains and even landslides in some areas of the two provinces, the observatory said. More than one million people have been evacuated in the two provinces -- 837,000 for Zhejiang and 230,000 for Fujian, while schools, airports, expressways and shipping services in some areas have been shut down. Meanwhile, vessels have been recalled to harbor. The tourism authorities in Zhejiang have closed almost all scenic spots along the coast, and evacuated more than 500,000 holiday-makers who had flocked to the seaside resorts for the week-long National Day holiday ending on Sunday. Also on Sunday, rescuers were battling against strong winds and billows to tow a Hong Kong-registered cargo ship to harbor, which suffered mechanical failure after having been hit by Krosa off the coast of Zhejiang's Wenzhou City. Twenty-seven crew members were aboard the ship, ALADDIN DREAM, including sailors from Russia, India and the Philippines, rescuers said. Krosa has left four dead, two missing and 52 injured in Taiwan, in addition to cutting off power supplies and halting highway and air traffic, according to Taiwan media reports.